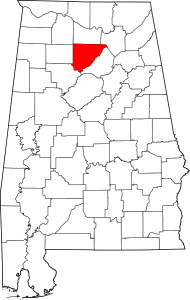 Cullman County is a county of the U.S. state of Alabama. The population is 80,406. The county seat is Cullman. Its name is in honor of Colonel John G. Cullman. Located 10 miles from Guntersville Lake and Guntersville Dam, 25 minutes south of Huntsville, 75 minutes north of Birmingham, 3 hours west of Atlanta, and 5 hours north of Mobile. Two of the state’s main arteries, AL Highway 231 North/South and AL Highway 69 East/West, come together in the middle of Historic Downtown Arab – a quaint setting, rich with history and bursting with charm. 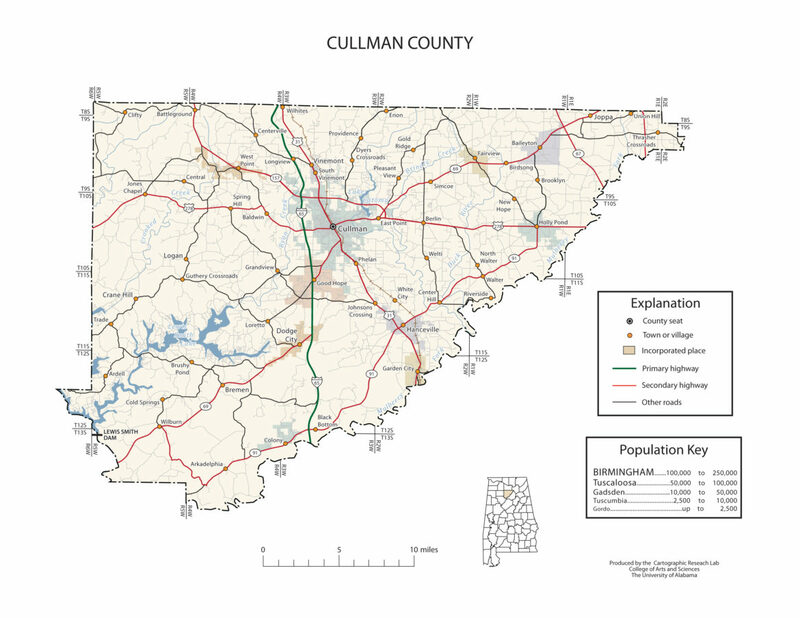 Cullman is the county seat of Cullman County. It is located along Interstate 65, about 50 miles north of Birmingham and about 55 miles south of Huntsville. Cullman is a thriving 21st Century community fueled by its quaint heritage and indelible Southern charm. Founded in 1873 by German refugee Colonel John G. Cullmann, our city is known for its early agricultural success and ability to accommodate widespread industrial projects. With a population currently hovering just over 15,000. Hanceville is located in north-central Alabama in Cullman County. It is home to Wallace State Community College and the Shrine of the Most Blessed Sacrament Cathedral at Our Lady of Angels Monastery. The Hanceville area was first settled in the 1820s by settlers from South Carolina and Virginia and was located in Blount County when it was created in 1832. Battleground is located in the northwestern section of Cullman County, bordering Morgan County, overlooking the Tennessee Valley. The name Battleground was derived from a battle that took place along the Forrest Streight Trail during the Civil War. One of the historical landmarks in Battleground is Battleground School. Built in 1932, the school was closed in the mid 1990s. Today it is managed and maintained by Camp Liberty located in Battleground. The Battleground School shares land with the Battleground Volunteer Fire Department. The largest corporate presence in Battleground is the 75-acre Camp Liberty a military-themed summer camp. Black Bottom is an unincorporated community in Cullman County located near the junction of Interstate 65 and Alabama State Route 91, 2.4 miles east of Colony, Alabama. Bug Tussle is a rural district in Cullman County located near the Cullman County and Walker County border. It is close to Bremen, Alabama and Lewis Smith Lake, along Alabama Highway 69 and Alabama State Route 91, and is southwest of the city of Cullman. Bug Tussle got its name after an early settler climbed a nearby mountain and said the people below looked like “bugs tussling”. Crane Hill is an unincorporated community in Cullman County, located in the southwestern portion of the county. The community of Crane Hill can trace its history back to 1806, when the first settlers recorded their land titles. This area is named after the Sandhill Crane who fished the streams and roosted on a hill located just north of Mt. Zion Road and part of the Kirby Lay property. It was from this large hill of roosting cranes that Crane Hill took its name. This area is nestled at the foot of the Appalachian Mountains, it offers a landscape with rock out crops and graceful meadows all well endowed with indigenous plants, wild flowers and a wide variety of wild animals. Smith Lake and many fresh water streams wind through the hills and rocks offering residents an opportunity to fish and enjoy one of the most attractive locations in Alabama. Many residents are family in this close knit community and several families have the distinction of having lived as many as six generations in this area. There are no traffic lights in Crane Hill.